The Fall ’19 styles and colorways were inspired by a combination of the American Craft movement, the traveling woman and a celebration of the outdoors. With rich autumn colorways and a variety of patterns and textures, the Fall ’19 collection is designed with the everyday woman in mind. Dedicated to finding new and creative eco-friendly fabrics that feel as great as they look, Aventura introduces new styles this season that incorporate recycled polyester and recycled cotton. The plaid button-up Jones Boyfriend Shirt ($75), made of 60 percent recycled cotton and 40 percent recycled polyester, features Aventura’s signature Handy Cloth microfiber phone and glasses cleaning cloth in the bottom front placket. Both the Vanessa Dress and the Beyla Dress are a recycled polyester and recycled cotton blend that look just at home in the office as they do out to dinner. The Vanessa ($99) is lightweight for fall, with contrast tipping around the collar and colorblocking down both sides. An asymmetrical sweep and collar make the Beyla ($109) a dress to express the wearer’s uniqueness! Contrasting chevron stripes accent the front of the dress and a mock neck keeps this dress on trend. Aventura also uses recycled polyester to create two fleece pieces that are a must-have for any winter athleisure wardrobe, the Atria and the Darcy Fleece. Wicking properties, mockneck styling with two collar buttons, and a kangaroo pocket make the super soft Atria Fleece ($99) a great everyday piece. Pair with the organic cotton baby wale Logan Skirt ($59) or Pant for a mountain lifestyle look. Perfect to wear with leggings, the Darcy Fleece ($99) is super soft on the inside and out for easy snuggling. A tulip-shaped front hemline and slimming fit in the back give this wicking top a touch of femininity. A zip pocket on the left hip can hold an ID or lipbalm. For those looking for a stylish way to keep the winter weather at bay, Aventura has designed the Lindon Jacket and the Solenne Vest. Stay warm and dry in the 100% polyester twill Lindon Jacket ($129), a double breasted, fully lined jacket with a DWR finish to keep the drizzle away on a cold fall day. When the weather is cool and dry, throw on the fashionably fresh Solenne Vest ($125). Cozy and warm, this long, polyester ripstop vest has 105 grams of blown polyester fill, a double zipper for ease of wear, zippered hip pockets and an interior cell phone pocket. 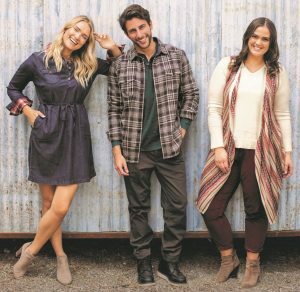 These styles and the rest of Aventura’s Fall ’19 collection can be seen at WWIN in Las Vegas, February 4-7, 2018, Booth #A2212-A2214. For additional information, please contact Angie Robinson at angie@darbycommunications.com.